The Propaganda Club, Adelaide, South Australia. Information, Photos and Reviews. 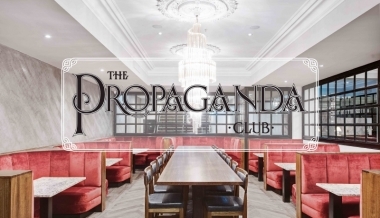 The Propaganda Club is an elegant Restaurant, Lounge and Cocktail Bar that embraces a New York inspired charm, blending comfort and a sophisticated decadence with full table service and food served until the very early hours of the morning. Located at 110 Grenfell Street, adjacent to Regent Arcade, the venue includes the Manhattan Dining Room, Soho Lounge and Sidecar Bars with areas providing comprehensive offerings of high quality foods and drinks, Tuesday to Saturday. The Propaganda Club comprises of three main areas, the Manhattan Room, the Soho Lounge and the Sidecar Bars. The venue’s decor references an old-worldly feel which is evident in the use of bespoke furniture design, architectural windows, distressed antique mirrors and reclaimed parquetry flooring throughout. Executive Chef James Lawrie has created a menu of unique and flavoursome dishes, paying homage to our local produces and suppliers and showcasing a selection of South Australia’s finest produce. Our innovative beverage menu combines flavour and theatre, pairing your dining experience with a creative beverage. We encourage our guests to experienced paired food with beverages as well as a multitude of other options available from our seasonal menu. Nobody has reviewed The Propaganda Club yet, Be the first. You are submitting a booking enquiry. The Propaganda Club will then contact you by email with details of availability and prices.